Thank you, Queen Victoria, for this wonderful long weekend. To celebrate this day, I made the kids a fun little queen-inspired lunch and they absolutely loved it. I had a crown cookie cutter, which made things a little easier, but if you don’t have one you can always use a knife to cut one out. This was really fun to make and the kids thought my version of the queen was quite silly. Here’s how to make your own queen-inspired lunch. 1. Grab your tortilla and cut out 1 crown shape, and 2 large circles. 2. Sprinkle some shredded cheddar cheese on top of the crown, and in between the 2 circle shapes. 3. Heat a skillet to medium heat and cook your tortillas until cheese is melted. Remove from heat and place the circle face and crown on a plate. 4. Using your knife, cut up your veggies. 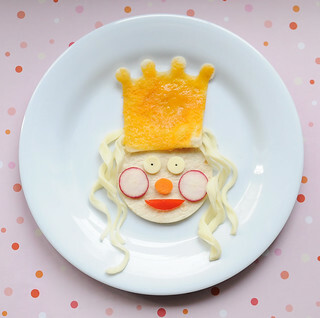 You’ll need 2 thin radish slices for your queen’s cheeks, 1 baby carrot slice for the nose, and 1 small red pepper slice for the mouth. Place these on your queen. 5. Using your small circle cutter, cut 2 eyes out of mozzarella cheese. Use some black food colouring to dot on 2 eyes and place these on your queen. 6. Take your twisty Cheestring, and untwist it into several pieces. Add these smaller Cheestrings to your queen for nice curly hair. Give this fun little queen lunch a try and enjoy your long weekend!